Odell Beckham Jr. should be ready to go in Week 7 after suffering no setbacks with his injured hamstring. New York Giants wide receiver Odell Beckham Jr. played 68 of 70 offensive snaps in the Giants' Week 6 27-7 loss to the Philadelphia Eagles, per Pro Football Focus. After the game, Beckham confirmed that he suffered no setbacks with the hamstring injury that kept him out of practice all week leading up to the game. “I felt good enough to play. I kind of stayed right where I'm at,” Beckham said to reporters per True Jersey. “I don't think there are any major setbacks. 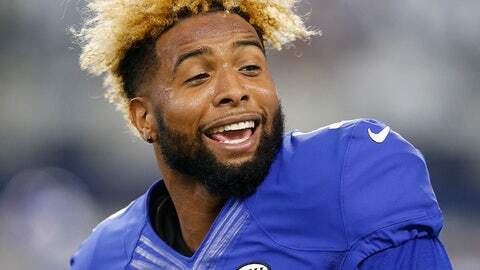 Beckham expects to be back on the field in Week 7 when the Giants host the Dallas Cowboys, but the hamstring injury might be one that he will have to deal with all season long. “I feel good. It's all a work in progress though,” Beckham said. “So you keep staying on top of it. It's part of being a pro, how you manage it. “I think I maintained and remained right where I'm at,” he added. Beckham finished Week 6 with 67 yards and a touchdown on seven receptions. He was targeted just one time in the entire second half, and he finished with zero second half completions. The Giants will need to get him more involved in Week 7.